Hey, I'm actually publishing another of these "Shall We Do It?" posts. Who would've thunk it, eh? Especially given my propensity to introduce columns with tongue-in-cheek titles that I return to only sporadically. Well, screw history. For the time being, at least, I'm really enjoying writing these posts. Plus, they're seemingly giving me that extra push that's sometimes needed for me to sit down and actually play the games I buy. With all of that out of the way, why don't I get to some of my experiences with those aforementioned games? I may as well begin with the game that captured the bulk of my attention over the last week and a half or so--The Legend of Zelda: A Link Between Worlds for the 3DS. I'm about 15 or so hours into A Link Between Worlds now and, boy, does it have me by the balls. 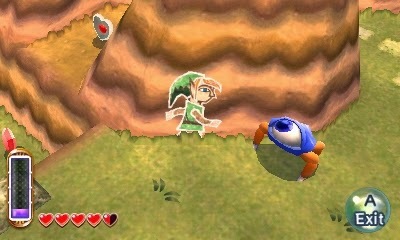 I love nearly every aspect of it--from the crisp controls, to the "it's amazing how pretty they are in motion" graphics, to the triumphant soundtrack, to the satisfyingly unique feature that allows Link to turn into a piece of graffiti so he can scamper along walls and shimmy through cracks. I even love the title's open-endedness--despite the fact that it's prompted me to turn to GameFAQs more times than I'd like to admit (because I'm completely stumped as to where I should go or what I should do next). My absolute favorite aspect of this portable adventure so far: traipsing through Hyrule's fabulously malignant flip side, Lorule. It's both beautiful and a bit creepy, plus its denizens really mean business (especially in comparison to most of the pushovers that populate the sunnier side of Link's habitat). Thankfully, I have a feeling I'll be exploring Lorule (and Hyrule) for a few more hours yet, as I've only completed what I believe to be just over half of the latter area's dungeons. Anyway, as much as I'm loving A Link Between Worlds, it isn't the only game I'm playing at the moment. One of the others: Hometown Story. Last time I mentioned this title, made by Harvest Moon's Yasuhiro Wada, I confessed to being a bit torn about it. On the one hand, I rather like how it looks--although some are sure to find it just a bit too twee--and I really like its 1990s-esque soundtrack, but the gameplay ... well, let's just say I'm still on the fence about it (and that I'm currently leaning toward the "it's not quite my bag" side of things). Although Hometown Story's main gameplay "hook," which revolves around running a shop in a quaint if somewhat creepily empty town, grew on me a bit during the hour and a half I spent with the title over the weekend (I've now played it for just over two hours), it still seems more tedious than fun. 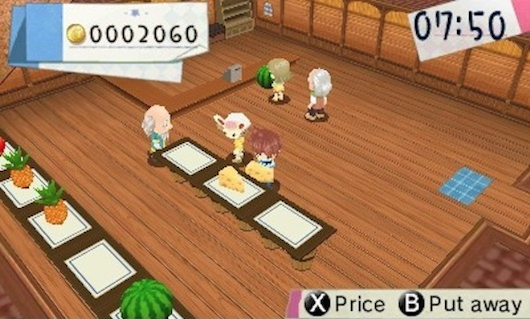 Don't get me wrong, I like that I'll be able to change the decor of my shop over time as well as expand its size, which will allow me to sell an increasingly diverse selection of goods to the town's citizenry, but I really can't see either of those things doing much to enhance the appeal of the title's core gameplay. In the end, the gist of Hometown Story seems to be: stock shelves, sell items, buy more inventory, stock shelves, sell items, buy more inventory--lather, rinse, repeat. If that sounds fun to you, you may just get a kick out of this Natsume-published release, but I'd be hard pressed to say I'm "enjoying" it at the moment. Still, I'm not quite ready to give up on it, so expect me to keep plugging away at it for a little while longer--and look for me to give it at least a passing mention in the next one or two "Shall We Do It?" posts, too. Last, but not least, I downloaded the Puyo Puyo Tetris demo from the Japanese 3DS eShop late last week and gave it a whirl. I've felt a roller coaster of emotions about this upcoming 3DS release--first feeling excited about the possibility of playing a game that includes two of my favorite puzzlers, Puyo Puyo and Tetris, then feeling disheartened after the first screenshots were released and revealed it would use the same boring art style the series has utilized since 2004's Puyo Puyo Fever. How do I feel after playing a few rounds of the just-released (in Japan, sorry) demo? Somewhere in the middle of the two above-mentioned extremes, I guess. On the positive side, Puyo Puyo Tetris feels really good. 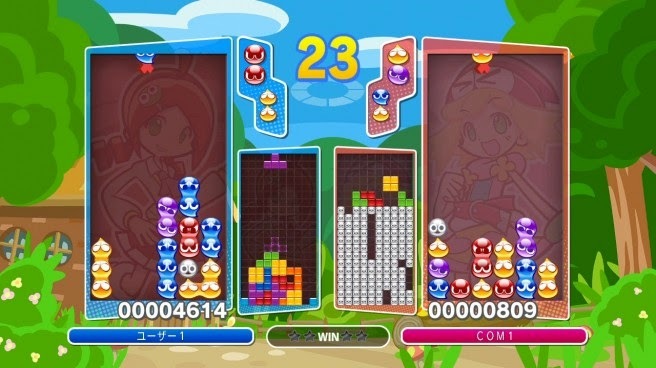 Also, I found it surprisingly fun to be able to choose to play either Puyo Puyo or Tetris against my AI-controlled opponent (who also could choose either Puyo Puyo or Tetris). Finally, I have to admit that, in action, this title's art style is more appealing than I originally considered it to be, although I still vastly prefer the old Puyo Puyo style to it. As for the demo's negative attributes: actually, I don't have any to share, other than all of the positives mentioned above failed to sway me to purchase the retail release that'll hit store shelves in Japan in early February. That said, I think it's possible I'll break down and buy it at some point in the future--although not until I've gotten my money's worth out of a few other 3DS puzzlers I've picked up (or pre-ordered) in recent months, including Kumamon ★ Bomber Puzzle de Kumamon Taisou and Touch Detective: Funghi's Big Breed. I want to go back to Zelda sometime and try to get everything. I beat it without finding all of the heart containers and hidden maimais. Glad to hear you're enjoying it.